The tax policy and charities field rarely considers the issue of volunteer labor for nonprofit organizations. However, volunteer labor is extremely valuable: the Urban Institute estimates that in 2013, nonprofits received aid from 63 million volunteers providing 8 billion hours of free labor—an estimated worth of $163 billion had these volunteers been paid wages (McKeever and Pettijohn 2014). This amounts to half of total charitable contributions in the USA in 2013, which Giving USA finds to be $335.2 billion (Giving USA Foundation 2014). These numbers may actually underestimate the value of the time people contribute to charities, because they do not count the labor of employees who work for low pay who might demand higher wages from a for-profit organization. In summary, volunteer labor constitutes a significant portion of nonprofit resources. Though charitable contributions can be deducted from income taxes, volunteers cannot deduct the value of their labor. However, if we assume that charitably inclined individuals choose between donations of time and money, then the tax subsidies for monetary donations will affect the volunteer labor supply. How would a change in tax policy reducing the deductibility of charitable contributions affect volunteering? How would a cap on the charitable deduction affect volunteer labor? Are donations of time and money substitutes or complements (Andreoni, Gale, and Scholz 1996)? If volunteer labor is a substitute for contributions of money, then eliminating the deduction for charitable contributions would increase volunteer hours as volunteering became more cost-effective relative to monetary donations. If the two are complements, however, then reducing the deductibility of donations would lead to a decrease in volunteer labor and monetary contributions, a double blow for charities. Brown and Lankford (1992) find that volunteer labor and cash donations are complements, with an elasticity for the tax price of cash donations of -2.1 for women’s time and -1.1 for men’s time. This means, for example, that if an alteration to the charitable deduction increased the tax price of giving for an individual by 10 percent, then that individual would reduce her or his volunteer hours by 21 percent (if she were a woman) or 11 percent (if he were a man). The implication is that volunteer labor is sensitive to charitable deductions and will decline if tax subsidies for contributions shrink. Other analysts agree that donations of money and time are gross complements (Clotfelter 1985; Dye 1980; Menchik and Weisbrod 1987). Why do donations of time and money appear to be complements? One explanation is that becoming involved in the charitable sector through one type of gift may encourage involvement in other forms. This offers another argument in favor of the charitable deduction. Many other variables affect the relationship between tax policy and volunteer labor, including the type of nonprofit organization, the supply of low-wage workers, government activity, and the tax system of the country in question. All of these factors are relevant to crafting public policy that encourages charitable volunteering. Should we allow volunteers who donate time instead of money to claim a charitable deduction? With the monetary value of volunteer labor worth 1.5 times that of material contributions, volunteer labor is clearly important to the charitable sector. However, estimating the value of volunteer labor for the purpose of a charitable deduction presents problems of measurement. For example, what wage should be used to calculate volunteer time? The Bureau of Labor Statistics estimates the assigned hourly wages for volunteers to be worth $20.16 in 2013, based on hourly earnings of all production and nonsupervisory workers on private nonfarm payrolls (average private wages) (table 1). The Urban Institute Center on Nonprofits and Philanthropy uses this number, whereas Independent Sector increases the estimate by 12 percent for fringe benefits, to $22.55 an hour (McKeever and Pettijohn 2014).1 Differences in how organizations value volunteer time create variability in estimates of the value of the entire sector. Another question is whether labor should always be valued at the same wage. If a doctor and a teacher both help pick up trash at the local park, it does not seem intuitively reasonable to place the doctor’s time at a greater monetary value than the teacher’s, even if they normally earn different wages. However, if the doctor offers free medical exams at a health clinic, it might be logical to consider this of greater monetary value to the charity than unskilled labor. After all, if the charity instead paid for medical services, such labor would be more costly. The one-size-fits-all hourly wage for volunteer labor does not consider this valuation issue. To value volunteer time differently depending on a standard rate for the job would be more accurate but require more complex accounting. Valuing volunteer labor is also made difficult by many volunteer organizations not keeping accurate records of volunteer hours and tasks (Ellis 1999). Other factors to consider in estimating an hourly rate for volunteer labor include a general measure of wages in the geographic area, wages of similar employers, and wages of similar positions. None of these factors, however, can measure volunteer labor’s intangible contributions to nonprofit organizations, such as encouraging community involvement in a cause. Under current law, volunteer labor is not deductible on an individual’s tax return similar to a donation of cash or in-kind goods. But volunteer labor is intertwined with the tax code in other ways. For instance, volunteers can take a charitable contribution deduction for expenses they incur in connection with their volunteer services, including travel to a volunteer site, uniforms, and supplies used for the job. To be deductible, however, the expenses must be ones that the charity would otherwise incur; the volunteer’s personal expenses are not deductible. For example, a meal eaten by a volunteer while on break is a considered a personal expense rather than an expense to the charity. Volunteer labor is also tax favored in the sense that nonprofit organizations do not pay payroll taxes on that labor. In addition, the government protects volunteers from tort liability for acts of ordinary negligence (but not gross negligence or criminal activity) committed in the course of their volunteer work. Also, volunteers have immunity from awards of punitive damages. Before the 1940s, nonprofit organizations were completely protected from tort liability, but since then, state legislation and some state court decisions have increasingly allowed injured parties to claim damages not only from volunteers or employees but also from charitable organizations themselves. Nonprofit organizations have less ability to limit liability exposure than for-profit organizations because they generally cannot control employee behavior through punitive measures. Thus, limits on liability are helpful for nonprofits and may increase their use of volunteer labor. Theoretically, it would be possible to directly subsidize volunteer time with an income tax deduction. This has been the subject of sporadic interest from nonprofit boards and from volunteers themselves, but it has never become a serious political proposal.2 Also, it would be extremely difficult for the IRS to monitor the use of volunteer labor by nonprofit organizations. In addition, there is already an implicit subsidy for volunteer labor (stemming from the nontaxation of the “income” produced for charities through such labor). Also, even without a direct tax subsidy for volunteers, the influence of tax policy will still be felt because of its effect on monetary contributions. According to economic theory, the fact that cash donations are deductible makes donations of time indirectly deductible (Long 1977). For example, suppose that a taxpayer who itemizes deductions decides to donate to charity. This taxpayer values an hour of his or her time at $100. The taxpayer can donate $100 to charity and not pay income taxes on the full donated amount. Alternately, the taxpayer can volunteer that amount of time to the charity and not pay income taxes on that value because the volunteer did not earn any wages to pay taxes on. Thus, both types of donations are tax free and the tax system is neutral with respect to donations of time and cash. One interesting consequence of this model is that regardless of whether they itemize their tax deductions, all taxpayers can consider donations of time to be tax deductible in the sense that they do not pay taxes on the value of their time. However, only itemizers receive a tax break on monetary donations; nonitemizers cannot claim the charitable deduction. Therefore, because nonitemizers pay taxes on donations of money but not on donations of time, they should have reason to favor the latter. Under this framework, if the charitable deduction were removed, then donations of time would become more attractive in comparison. However, as discussed further on page 6, the empirical evidence tends to show that volunteers do not view money and time as substitutes. One possible reason for this is that taxpayers generally do not perceive this trade-off and instead consider monetary donations as tax deductible and donations of time as not tax deductible. Another explanation is that people may have preferences beyond efficiency when considering donating time or money (Lilley and Slonim 2014). Also, Freeman (1997) suggests that although money and time may seem to be substitutes, people with a “taste” for charitable activity might be likely to do both together. Feldman (2010) draws a similar conclusion: those who become involved in nonprofit organizations through one type of donation are more likely to be asked to donate through other channels as well. Estimates vary widely on the effects of tax policy—and the charitable deduction in particular—on charitable donations. There is no consensus on a measure of the effect of the charitable deduction on contributions to the nonprofit sector. The income tax deduction for charitable contributions encourages giving by lowering the cost of donations. For example, if a taxpayer who itemizes saves 30 cents in federal and state taxes on every dollar donated, then the price for donating a dollar is 70 cents. Economists measure how responsive people are to the cost of giving by calculating the “price elasticity” of giving—the percentage change in charitable donations caused by a 1 percent increase in price. In practice, it is difficult to distinguish the effects of tax incentives from the effects of other factors, and these effects vary from person to person. Economists have debated the magnitude of the price elasticity of charitable giving for years. Although donations of time and money should theoretically be substitutes, the consensus of empirical study seems to be that the two are complements: those who give more monetarily are also more likely to volunteer their time, and when the tax price of donations falls, gifts of time increase alongside gifts of money. However, the degree of this change varies between studies. As mentioned, Brown and Lankford (1992) find an elasticity for the tax price of cash donations of -2.1 for women’s time and -1.1 for men’s time. This means, for example, that if an alteration to the charitable deduction increased the tax price of giving for an individual by 10 percent, then that individual would reduce her or his volunteer hours by 21 percent (if she were a woman) or 11 percent (if he were a man). Andreoni, Gale, and Scholz (1996) also find that gifts of time and money are complements, with volunteer labor having a net wage elasticity of -0.8. Their study uses data from survey of volunteer activity conducted by the Gallup Organization on behalf of Independent Sector. Their estimates of elasticities imply that eliminating the deduction for charitable giving would reduce charitable contributions by 5.7 percent and reduce volunteer hours by 0.7 percent. The study also finds that extending deductibility to taxpayers who do not itemize on their returns would increase monetary contributions by 3.0 percent and increase volunteer hours by 0.6 percent. Overall, they find that policy changes that affect charitable giving have a complementary effect on volunteer hours. Empirical evidence shows that proposals to decrease or eliminate the tax deductibility of monetary donations will also reduce contributions of volunteer labor. Although economists vary on how much either contributions or volunteer labor will change based on tax subsidies or to what extent the two are complements, the consensus is that the two move in the same direction. Nonprofit organizations dependent on volunteer labor need to pay attention to changes in tax law. In theory, donations of time and money should be substitutes rather than complements. This does not coincide with the empirical evidence. Feldman (2010) offers one possible explanation. Feldman concurs with the consensus that a decrease in the tax price of monetary donations will increase donations of both time and money. However, Feldman also concludes that this is not because the two are complements, but rather that donations of time and money are substitutes, and that other factors cause a donation of money to increase the ease of volunteering. For example, individuals who donate money are more likely to be asked to volunteer, and with monetary donations an individual will increase involvement with and receive information about charitable activities, which could naturally lead to increased volunteering. Feldman concludes that these influences outweigh the substitution effect between time and money. Rotolo and Wilson (2006) find that nonprofit-sector employees are the most likely to volunteer—and with the most hours—compared with public-sector, private-sector, and self-employed workers. Although not directly related to the question of donations of time and money as complements or substitutes, this finding indicates that involvement in the nonprofit sector in other ways increases the likelihood of volunteering, perhaps as a result of the “taste” for charitable activity described by Freeman (1997). This offers another rationale for Feldman’s observation that people who increase their donations of money to charities are also more likely to increase donations of time. Additionally, diversity across the nonprofit sector ensures that the effects of tax law will vary for different types of organizations. Segal and Weisbrod (2002) examine separately health, education, and religious organizations, three sectors that heavily employ volunteer labor, based on personal demographics, household composition, and tax status. They find that the marginal volunteer labor supply effects are different in each sector. Concerning tax status in particular, Segal and Weisbrod (2002) find that, controlling for other factors, taxpayers who itemize deductions volunteer with significantly more frequency with religious organizations and with less frequency with education organizations. Overall they find that itemizers compared to those who do not itemize volunteer an additional 4.4 hours per month to religious organizations and approximately 2.1 fewer hours to education organizations. The effect of itemization status is near zero for health organizations. The difference between religious organizations and education organizations is both statistically significant and large relative to the mean of 18.4 hours a month. Segal and Weisbrod (2002) also find that a decrease in the marginal tax rate, which raises the tax price of monetary contributions for volunteers, will reduce volunteering to education organizations but increase volunteering to religious organizations. They find that a 1 percent decrease in the marginal tax rate causes a 1.4 hour a month decrease in education volunteering and a 4.6 hour a month increase in religious volunteering. For health organizations, no relationship is found. Thus, it appears that donations of time and money are complements for the education sector but substitutes for religion. Findings such as these, which indicate variance across different parts of the nonprofit sector, are important to consider alongside the more general conclusions about the complementary nature of gifts of time and money. After all, individual nonprofit organizations would be more interested in the effects of tax policy on their organization in particular, not on the sector as a whole. Also, different types of nonprofit organizations could find that public policy related to volunteer labor affects them differently based on the demographics of their volunteers and how much they rely on volunteer labor. Straub (2005) further highlights the difficulties in creating a model that can decisively test whether charitable giving and volunteering are substitutes or complements, particularly in a way that can be applied to the general population. Tax law only affects volunteers or donors who itemize their deductions. However, incentives for both itemizers and nonitemizers to volunteer include increasing a worker’s human capital in skills, work experience, and social connections (Day and Devlin 1998). The dominant force behind volunteering is not tax subsidies but rather social and moral motivations. A Gallup survey for Independent Sector found that the most common reason to volunteer was to help others, followed by a current or previous benefit to a relative or friend (Segal and Weisbrod 2002). How Do Organizations Decide to Use Volunteer Labor? Because the deduction for monetary contributions affects incentives to volunteer, tax policy is important to the supply of volunteer labor. If volunteers substitute for paid workers, then nonprofit organizations save money by increasing volunteerism. Simmons and Emanuele (2010) find a positive relationship between the minimum wage in a state and the amount of volunteer labor, implying that organizations use volunteers as substitutes for low-wage workers. However, there is no consensus on how fully volunteers can substitute for paid workers. Stine (2008) finds that volunteers in public libraries act as complements rather than substitutes to paid staff. Wolff, Weisbrod, and Bird (1993), however, find that the supply of volunteer labor for hospitals is affected by tax rates. A Canadian study found that religious congregations, organizations with workload increases, and organizations with fewer full-time employees were more likely to interchange tasks among volunteers and paid staff (Chum et al. 2013). A recent Austrian study by Bittschi, Pennerstorfer, and Schneider (2013) finds a partial substitution effect: a substitution between volunteers and paid workers in nonprofit organizations faced with increased economic competition, but not in organizations with stable or decreased competition. It also finds that substitution effects depend on the type of organization and the type of labor. This is intuitive: certain jobs require specific skills or more time than a volunteer can provide. A hospital, for example, cannot save money by replacing brain surgeons with volunteers. One type of volunteering that does address the need for skilled workers is for-profit workers’ pro bono work, such as a lawyer who agrees to represent impoverished clients without a fee. Although pro bono volunteers also do not receive an income tax deduction, there may be other relevant incentives. For example, five states allow lawyers to use pro bono cases to earn credit toward their mandatory continuing legal education requirements (Thiemann 2005). Thiemann (2005) proposed that lawyers could be encouraged to work pro bono by offering a tax credit for hours worked. Ironically, such a credit would be easier to design for lawyers than for volunteers as a whole because lawyers tend to keep diligent track of their hours. Handy and Brudney (2007) find that volunteer recruitment is more successful if the costs to volunteers are minimized. This supports the usefulness of the tax deduction for volunteers’ related expenses. Also, they find that nonprofit organizations may prefer to use volunteers not only because of the cost advantage over paid workers but also because there are positive externalities in using volunteer labor: volunteers are more likely to be involved in community affairs, to advocate for the organization’s cause, and to serve as role models for future volunteers. Among paid workers for nonprofit organizations, many accept lower than market wages. Preston (1989) found average nonprofit wage differentials of approximately -0.20 for managers and professionals and -0.05 for clerical and sales workers in two national worker data sets. Thus, a white-collar worker in the for-profit sector might be paid as much as 20 percent more than a worker with the same job in the nonprofit sector. Furthermore, Preston found that the lower wages in the nonprofit sector could not be explained by differences in employees’ human capital, differences in the broad industrial locus of nonprofit firms, or the existence of compensating differentials in the characteristics of similar jobs in the two sectors. Although the amount of lower wages for paid nonprofit workers is not calculated as volunteer labor, it is nevertheless a contribution to the nonprofit sector that could be estimated. The relationship between tax incentives and volunteering may vary internationally. To give an overview: a 2011 report from the European Foundation for the Improvement of Living and Working Conditions found that more than one-fifth of Europeans participated in voluntary and charitable activities (McCloughan et al. 2011). In 2011, the highest rates of participation were in Denmark, Finland, and Sweden, where on average 45 percent of those older than age 18 volunteer. In Greece, Malta, Portugal, Spain, and the newest member states—Bulgaria and Romania—the participation rate averaged from 10 to 15 percent. The United States falls between these two ranges: 28.6 percent of the US population volunteered in 2011. Those who participated in volunteer activities spent on average 6.5 hours per week in both the 15 European Union states and the 12 new member states, despite the differences in their participation rate. What affects the different rates of volunteering in different countries? McCloughan and colleagues (2011) find that countries with more unpaid household labor have less volunteering, and the authors note that people in these countries may have less capacity to volunteer. These conclusions are particularly interesting because the government would not necessarily want to cut social expenditures, reduce democratization, or decrease its own approval rating, even if these factors were correlated with increased volunteering. The relationship between government policy and nonprofit volunteering deserves further research because it is a largely untapped area. However, there have been similar findings in the United States. For example, Duncan (1999) predicts that government spending on charity can crowd out donations of volunteer labor. For tax implications, economic theory differs depending upon the tax law of a country. We have discussed how the income tax deduction for charitable contributions interacts with the volunteer labor supply in the United States, and is generally found to be complementary overall. However, not all countries subsidize charitable organizations or do so in the same way. For example, the United Kingdom encourages charitable giving through a tax incentive called Gift Aid. Unlike the United States, where taxpayers can reduce their tax burden based on their contributions, the United Kingdom instead gives the tax savings to the charities themselves: the government applies the basic income tax rate to the amount of the donation and gives this money to the charity. Usually this means that the government adds 25 percent to the donation. Taxpayers who pay higher tax rates than the basic tax rate can deduct their additional taxes and receive a tax break. In this case, the taxpayer and the charity would split the tax savings. How might this different tax incentive affect the relationship between volunteer labor and monetary donations? There is a dearth of research on the subject. We cannot simply compare the rate of volunteering in the United States and the United Kingdom because of the multitude of other influencing factors. Intuitively, it would seem that the substitution effect would be the same because under both systems the government does not collect income tax on charitable contributions. Because Gift Aid can be claimed by all taxpayers instead of only itemizers, it might encourage giving—and volunteering, if the two are complements—across a broader population. Another example of an unusual charitable tax incentive appears in Canada, which uses a two-tier credit system. A deduction reduces taxable income whereas a credit directly reduces tax liability. In Canada, taxpayers receive a credit equivalent to the lowest marginal tax rate, currently 15 percent, for the first Can$200 that they donate and then receive a credit of 29 percent (the highest marginal tax rate) for all donations in excess of Can$200. The same tax credit applies to donors of all income levels. For example, take a Canadian taxpayer who donated Can$500 to charity under current tax rates. The first Can$200 of this donation would receive a tax credit of 15 percent or Can$30. The remaining donation would receive a tax credit of 29 percent of $300 or Can$87. Thus, the Canadian donor would reduce his or her taxes by the sum of the two, Can$117. This system gives all taxpayers the same reduction in taxes for the same donation amount, regardless of the income tax bracket of the donor. However, it does so by raising the incentives of other donors instead of decreasing the incentives for the wealthy to give. It also encourages larger donations by offering a more sizable credit past a certain floor. If contributions of money and time are substitutes, then the Canadian system would increase the value of donating money as opposed to time because taxpayers could potentially claim a credit larger than their income tax. (The benefit of donating an hour of time would be the percentage of your own income tax rate, whereas the benefit of donating an hour of wages would be the percentage of the highest income tax rate.) However, if time and money are complements, then the enhanced incentive in Canada would be expected to increase both. It is worth noting that Canada originally had a charitable deduction similar to the United States and moved to the two-tier credit in 1988 as part of a larger tax reform initiative. Empirical evidence has not shown any major shifts in charitable donations after the change in terms of total donations or the size of individual’s contributions (Carter 2009). Comparing the years directly before and after 1988 also showed no significant changes. Finally, no evidence was found of a shift in donations by income group. Other factors could have obscured changes in response to the new tax law. Comparisons in tax incentives and volunteer labor across countries is an untapped area with potential to teach us more about how tax systems can be used to encourage the supply of volunteer labor. The interaction of tax policy and volunteer labor is a fertile area for research. But research in this area is a struggle: the multitude of other factors besides tax policy that interact with contributions of time and money, the lack of a comprehensive data set examining volunteers by tax filing status and tax bracket, and the differences across various parts of the nonprofit sector all obfuscate clear data regarding how these pieces interact. On the international level, variables become even more complex, but there is also an opportunity to compare how different charitable incentives interact with volunteer labor. More research in this area is important because when governments attempt to encourage charitable giving through tax incentives, it is vital to know if these incentives will encourage or discourage volunteering. Otherwise, any measure of their effect on the nonprofit sector is incomplete. Perhaps the most significant conclusion to draw is that the value of volunteer labor is increasing over time: the value of volunteer time and total annual hours volunteered both showed a steady increasing trend from 2005 to 2013. Volunteerism will continue to play an important role in the nonprofit sector in the future. 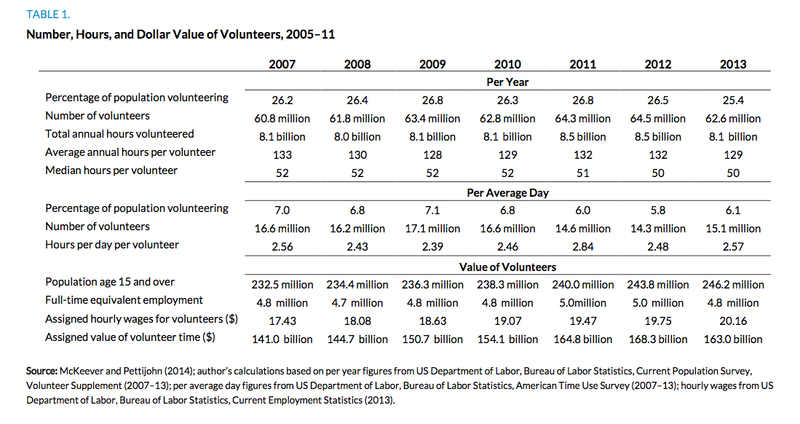 The data in table 1 offers additional information on the value of volunteer labor. 1. “Independent Sector's Value of Volunteer Time,” Independent Sector, accessed October 17, 2014, http://independentsector.org/volunteer_time. Katherine Toran is a former research assistant for Eugene Steuerle at the Urban Institute. Her research areas included tax policy and charities and public investment in children. Toran graduated from Grinnell College in Grinnell, Iowa. Copyright © October 2014. Urban Institute. Permission is granted for reproduction of this file, with attribution to the Urban Institute.